As an entire generation of 16 year olds, 18 year olds and university students go into mass panic again for the exam season I really ask myself whether it has to be like this. I don’t have any problem with putting young people under pressure – it’s good for all of us to learn how to handle it. But according to Cary Cooper, British stress guru, when pressure exceeds your ability to cope it becomes stress and this is damaging to health and your ability to perform. You would imagine that schools would want to teach young people how to handle pressure, not how to handle stress! Today I watched some videos made by Teachers TV about stress amongst teachers. Teaching is recognised as one of the most stressful jobs of all and the overwhelming majority of teachers say they are stressed. It’s no wonder that their students are also stressed – stress is highly catching. It’s interesting to look at why we get stressed. Basically when we feel a threat we need lots of extra energy to deal with the threat, so we start to pump extra blood around the body to supply the energy. However this response is really designed to provide us with the physical energy either to fight the threat (as in a wild animal for example) or run away from it – neither of which responses are appropriate for most modern threats which are far more often emotional or psychological rather than physical. However my experience has shown that whatever threat we feel, we really do need extra energy to deal with it. We experience stress when we don’t have enough energy to handle the demands of our life, whatever they may be. So young people feel stressed about exams because they feel too much pressure, whether it’s real or not, and they can’t cope. So I started to look at the materials available to help with exam stress. 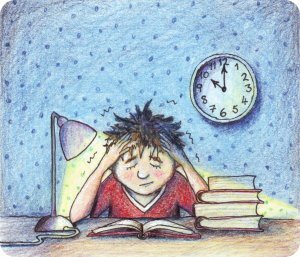 There’s a lot of text out there, describing all the symptoms of stress, strategies for revision and instructions on how to relax. Pages and pages of text! I keep wondering how someone who is already working too hard and probably reading far more than is good for them is supposed to take in all the extra information. Then there are some videos – the most recent being a video of a group of students in an exam room doing a kind of Mexican Wave whenever the invigilator is not looking, made by Childline. The message is that there’s no need to feel stressed about exams. It’s fun but what use is a Mexican Wave to someone who is really stressed and needs a solution. The strangest thing is that if you ask anyone what’s the best way to calm down they will tell you to relax. It’s so obvious it hardly needs mentioning. You can imagine people everywhere telling young people to relax. But the tricky part is that it’s hard to relax when you’re stressed. When you most need it is the time when it’s hardest to do it. So when I decided to make a programme to help young people overcome exam stress my main objective was simply to teach them how to relax. If you can relax you can let go of stress easily. It just disappears, often without you even noticing. It is really so simple that when you know how to do it you wonder how there can possibly be so much fuss about exams. Why don’t they just teach everyone how to relax? 1. No one teaches young people to relax because they don’t know how to relax themselves. Clearly teachers are very stressed so not in a good position to teach relaxation. Most parents are probably the same. 2. It’s too simple (and maybe it would put the psychologists out of a job). The hardest part about relaxation is remembering to do it – especially when you’re stressed. It’s almost as if we get addicted to being in a panic and completely forget to do anything about it. But it is the simplest way of getting more energy into your system quickly, and that’s all you need to calm down and put things into perspective. Relaxing should be the modern approach to dealing with threatening and stressful situations. It’s as important as exercise and yet it simply hasn’t found its place yet in school or elsewhere. Instead of pumping blood around your body, which raises your blood pressure, heart rate and breathing rate, you pump energy around the body which makes you feel calm, peaceful and pleasantly content. That’s a great way to prepare for exams. Oceen’s new programme, Rise Above Exam Stress, leads students to relax both physically and mentally while they are revising and helps them to focus on the day of an exam. It’s as easy as listening to music.